It is important for farmers to know the health of their soil, because it has an impact on almost every aspect of a farming practice. There is an interesting book – Visual Soil Assessment by Graham Shepherd – which I think can be of great use for farmers to get an idea of their soil health. Farmers are reliant on healthy soils as a medium for the growth of high quality feed (e.g. ryegrass pastures, oats, maize and sorghum, to name just a few). Soil health relates to the effective functioning of a balanced range of different soil micro-organisms that are able to break down organic matter and cycle nutrients. A healthy soil has good structure, is well aerated and has the right set of nutrients that are in balance and available to plants and /or soil micro-organisms for uptake. Having a healthy soil makes it possible to reduce fertiliser costs and chemical herbicide and pesticide control. It will also reduce the need for physical actions on the farm such as ripping. 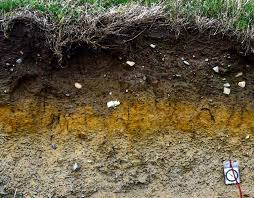 Deterioration in soil health is associated with negative impacts on pasture and crop production and quality, negative impacts on animal health, increased production costs, increase nutrient losses, greater greenhouse gas emissions and decreased carbon sequestration. It is important for you as the farmer to evaluate your soil in order to assess its health for yourself. There are many ways in which soil health can be assessed, but many of them are time-consuming and require the services of professionals such as soil scientists, fertiliser reps and agricultural consultants. There are alternative, cost-effective methods that can be carried out in the field. These methods help farmers to visually evaluate the quality of the soils under different crops or pastures. It should be noted that such a visual soil assessment should never replace taking soil samples and having them comprehensively analysed. Using the two methods in conjunction creates a powerful tool to manage and identify opportunities to improve soil health. The health of the soil may be improved by improving the following soil properties that can be used in the visual soil assessment of your farm. Visual Soil Assessment by Graham Shepherd is a useful field guide to a few soil physical properties, which will be discussed below. Texture can be used to determine what type of soil you have, as it is important to manage different soil types in different manners. Texture cannot be changed, but it relates to many soil properties relating to healthy soils so it is important to take note of the texture. For example a soil with more clay can hold nutrients better, but require a different irrigation approach than a sandy soil with poor nutrient holding capacity and a higher irrigation demand. 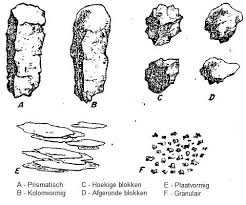 Soil porosity refers to the amount of open spaces (pores) in between the smaller parts of the soil (aggregates). The more macro pores and coarse micro pores there are the better the condition of the soil. The number and colour of soil stains indicate how well the soil is drained and how well it is aerated. Dull coloured stains will appear on poor soils if they are waterlogged for prolonged time periods and if aeration is poor, while good soils with good aeration and no waterlogging will display no stains. Soil colour is a good indication of the amount of organic matter and humus in the soil. This organic matter is necessary to feed the soil life. A darker soil colour is associated with higher levels of organic carbon and humus and a better soil condition, while soils with a lighter colour are associated with lower levels of organic matter and humus and poorer soil conditions. 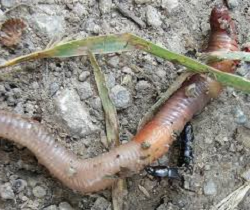 The number and type of earthworms in the soil, as well as the amount of earthworm casts on the soil surface, are good indicators of the health of the soil. 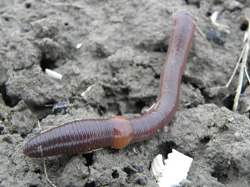 The more earthworms, and greater diversity, there are the better the soil condition is. 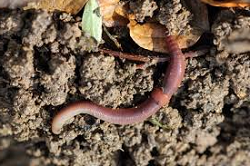 Earthworms are good for the soil due to their burrowing, feeding and digesting activity in the soil. The burrowing activity of earthworms opens up spaces in the soil for other soil life to inhabit. The open spaces also allow roots to move easier through the soil and facilitates uptake of CO2 in those spaces and allows for the conversion and storage of carbon in the plant biomass. The feeding and digesting activity of earthworms also makes larger organic matter parts available as mineral nutrients that can be taken up by the plants as well as other soil life. These activities carried out by the earthworms will also improve soil structure in the long-term. The smell of the soil is a good indicator of soil life due to the gases that the soil life releases in the soil. The smell of the gases released by the soil life is affected by the type and amount of organic matter and humus in the soil. A soil will have a good visual score if it smells earthy, sweet or fresh. A soil will have a poor visual score if it smells putrid, sour, chemical or unpleasant. 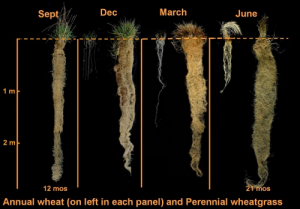 The potential for plant roots to grow to deep layers in the soil profile is restricted by a root growth barrier that is also known as a hardpan. The depth up to which plant roots can grow without any resistance is an indication of the soil to be a good rooting medium (deep root depth) or bad rooting medium (shallow root depth). The rooting depth is also an indirect indicator of the capacity to store available water in the soil and an indication of the availability of soil nutrients; that will increase with an increase in rooting depth. A good rooting depth is 800mm or deeper and a poor rooting depth is 200mm or shallower. Surface ponding is an indication of the amount of water and the time duration of the water on the surface, which indirectly indicates the rate of infiltration into and through the soil, the presence of a shallow water table and the time that the soil stays saturated. The soil surface of a pasture will have a good condition if no ponding occurs a day after heavy rain on soils that were at or near saturation and there will be no bare patches on the soil surface. A soil surface will have a poor condition if there is still surface ponding visible seven days after heavy rainfall and if there are bare patches of soil distributed throughout the pasture. The evenness or roughness of the soil surface under pastures may be indicative of grazing pressure on the structural condition of the soil. Pugging may occur under intensive grazing by excessive animal numbers of especially heavier animals than the soil surface can carry. A visual soil assessment with a full soil sample analysis is a powerful tool to predict when soil quality starts deteriorating. This allows preventative management actions to be taken based on selective soil samples that were fully analysed and prevent further degradation of the soil. This will reduce the negative impact of poor soil quality on pasture production and animal performance and in future ensure long-term farming success. What is pasture-based dairy farming? Why diversify your pastures?